A survey has found drivers making corrections when following sat-nav instructions are performing risky manoeuvres and putting lives in danger. The survey by road safety charity Brake and Direct Line found that more than one in seven (15%) drivers who use a sat-nav admit making risky manoeuvres to correct mistakes when following sat-nav instructions, while one in 14 (7%) drivers have had a near miss, having to swerve or brake suddenly to avoid a hazard, because they were distracted by a sat-nav, rising to one in 10 (11%) among young drivers (17-24). In addition, 7% of drivers also admit to having a similar near miss because they were fiddling with their stereo, rising to one in 10 (11%) among young drivers (17-24). According to Brake, when used responsibly, using a voice-based sat-nav can make you a safer than using a visual display or paper map, as you can navigate without looking away from the road. However, the charity says there is some evidence that relying on a sat-nav can make you drive faster and make you less observant. Fiddling with a stereo can also make you react slower and make more errors. Julie Townsend, deputy chief executive, Brake, said: “Remember, the sat-nav is there to help you keep focused on driving rather than worry about directions, but it's not there to make all the decisions for you. Through its drive smart campaign, Brake is calling on all drivers to make a new year’s resolution to stay alert and keep their mind and eyes on the road. Research shows almost everyone is unable to multi-task at the wheel without driving performance being badly affected. Brake is also calling on drivers not to be distracted by the range of technologies being installed in many new cars that have nothing to do with driving, such as access to social media. And, it’s appealing to the Government to regulate the use of features that can pose a dangerous distraction to drivers. Townsend continued: “For many drivers there is an increasing array of technological temptations that can pose a deadly distraction. 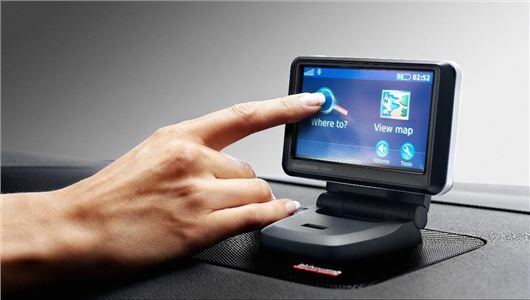 Rob Miles, director of motor at Direct Line, added: “Looking at the sat-nav while your eyes are meant to be on the road is no different from trying to drive with a map in front of you. It's dangerous, and you shouldn't do it. “If you're going to use sat-nav to guide you through a journey, better to use a voice-based version so you can keep your eyes on the road. “If you need to change direction or turn around, do it safely, even if it takes a bit of time to get to the next roundabout rather than doing a U-turn.